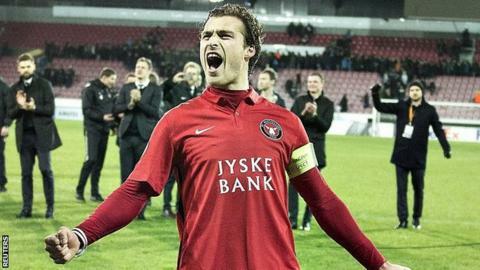 Denmark central defender Erik Sviatchenko has signed a four-and-a-half year deal with Celtic. Sviatchenko, 24, joins from Danish champions Midtjylland for a fee in the region of £1.5m. "I will do everything I can to bring success to Celtic," Sviatchenko told the official Celtic website. "It means so much to me to join a winning club, to join a club that goes for and wins trophies and wants to play in the Champions League." Sviatchenko made his international debut in March and has since earned three more caps, and also has Champions League experience with the Danish champions. He also helped them reach the last 32 of this season's Europa League. "I have had a taste of winning with Midtjylland and I want more of this feeling at Celtic," he said. "When you play football, you want to be remembered for winning and I want to be remembered as a winner with Celtic. "I know we have a squad of really talented players and I can't wait to get started, team up with them and get to work."